Democratic presidential candidate Hillary Clinton and her running mate Tim Kaine held a rally Saturday Oct. 22 in University City to encourage attendees to vote on their behalf. “If we win here, you can guarantee it, take it to the bank, Hillary Clinton will be the next president,” Kaine said. He then offered his endorsement of Katie McGinty, the Democratic Party’s candidate for Pennsylvania senator, who is currently locked in a neck-and-neck battle with Republican incumbent Pat Toomey. The RealClearPolitics polling average as of Oct. 19 has Toomey polling at 44.8 and McGinty at 43.0. Kaine lauded Clinton’s performance in the Oct. 19 debate. “Hillary showed us stamina, backbone, guts, courage, preparation, knowledge, experience, judgment, but especially the grace and the poise and the temperament that we want in a president of the United States,” Kaine said. He mentioned that Trump had cast doubt upon Clinton’s stamina, but argued that Trump was in fact the one who lacked stamina during the debate. “She was ready to go…but Donald looked like he just had to get back to start tweeting out more insults,” Kaine continued. Kaine also criticized Trump’s reluctance to accept the outcome of the presidential election, even if he loses. He continued to emphasize that a Trump loss would not be due to a rigged election, but rather the fact that the Republican candidate has alienated multiple demographics of voters. “It was like after he spent the whole campaign insulting one group after the next, immigrants, women, Muslims, POWs, Gold Star family, African Americans, he got to the end of the campaign, and there was nobody left to insult,” Kaine said. He transitioned into an endorsement of equal pay and treatment for women, citing important female figures in his life such as his wife, campaign managers, cabinet secretaries and more. He then posited that it was a woman’s turn to hold the highest office in the United States. “Just isn’t it time, after 240 years of American history, 96 years after women got the right to vote when the constitution was changed — isn’t it about time that a woman should be president of the United States and our commander-in-chief?” Kaine said. He concluded his speech by urging the audience to vote before introducing Clinton. 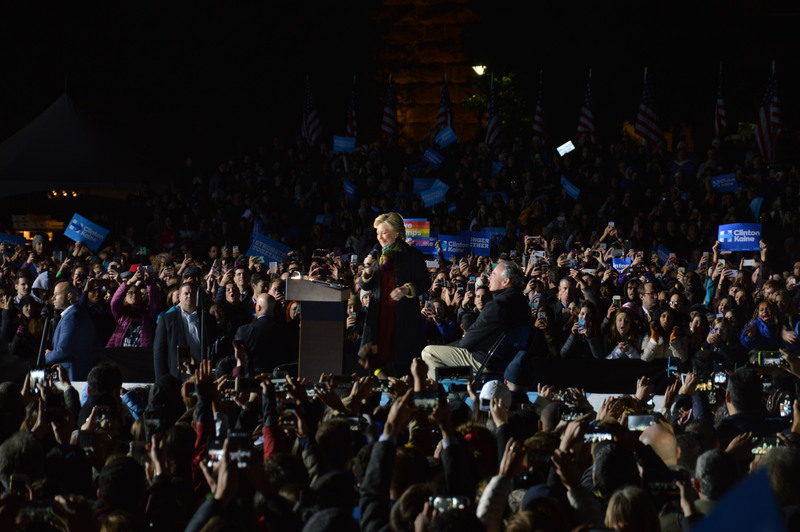 Clinton thanked the Daily Pennsylvanian for endorsing her. She also started her speech with words of support for McGinty and a recap of her performance in the third debate. Like Kaine, she criticized Trump for refusing to guarantee that he will accept the election results. “Make no mistake, my friends. This poses a direct threat to our democracy,” Clinton said. She then remarked that more people are currently registered to vote than ever before. 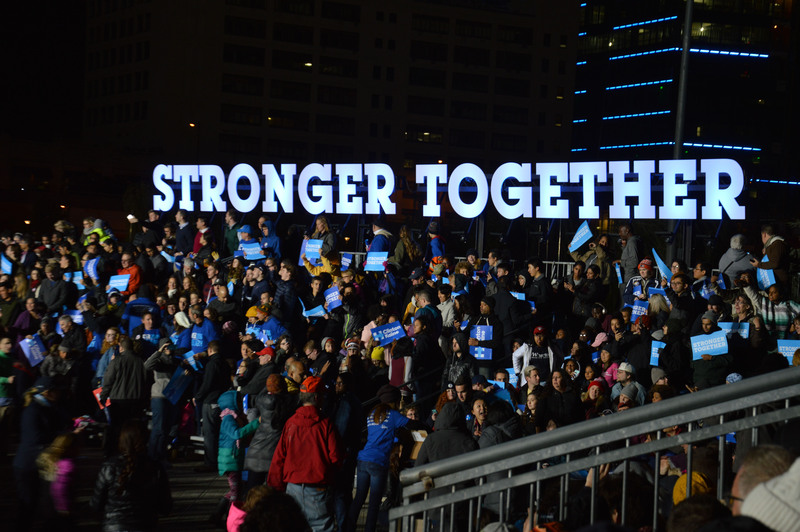 In November 2012, 8,508,015 voters were registered in Pennsylvania. As of Oct. 24, 2016, that number has risen to 8,693,648. “This could truly be the election that young people turned out in larger numbers than ever to make their votes and voices heard,” she said. “What I think is happening is that people are coming together, Democrats, Republicans, and independents, all to reject hate and division that sets Americans against one another,” Clinton continued. She then appealed to those in the audience who weren’t among her supporters, saying that she would advocate for them as well. “I want to be your president too, and I will work for you, and I will fight for you as well. I believe we can disagree without being disagreeable,” she said. Clinton criticized Trump for wanting to cut taxes for the wealthy, and for refusing to release his tax returns. She then pivoted towards her own plan to create more employment opportunities for Americans. “We’re going to make the biggest investment in new jobs since World War II — infrastructure jobs, advanced manufacturing, technology, innovation, research, clean energy jobs,” she said. In terms of education, she touched on several major issues. She expressed her intention to establish universal pre-kindergarten programs as well as apprenticeships and high school technical education programs. She also discussed her plans for modifying tuition at public colleges. “Bernie Sanders and I got together and we worked out a plan that will make it possible for any student in a family that makes less than $125,000 a year to go to public college tuition free – and over that family income, to go debt free,” she said. She wrapped up with a final encouragement for the audience to vote, citing her positions on raising the minimum wage, equal pay, Planned Parenthood and gun control. “Friends don’t let friends vote for Trump,” she said. She ended the speech by entreating the audience to consider the future of the country. “So think about the future we want, think about the future we can create, and remember, love trumps hate,” Clinton concluded. The presidential election will take place Nov. 8. Registered voters can find their polling place at iwillvote.com. In Pennsylvania, polls will be open from 7 a.m. to 8 p.m.